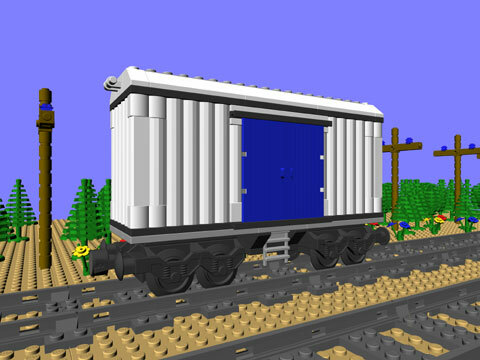 The CTB-1123 Refrigerator Car is a short (20 studs) four axle piece of rolling stock. The majority of the design is derived from the use of the 2x5x6 Log Wall element found in many of the Western sets (in brown) and several of the Ninjas sets (in white). This model uses a number of pieces which may be hard to find, notably the white log walls and 2×6 slopes and the blue sliding doors. While these elements may not be readily available, you may be able to find them on BrickLink. The white slope appeared in two sets, the white log walls in five sets, and the blue doors six sets. Printed and bound instructions for CTB-1123 are available for purchase on Bricklink.